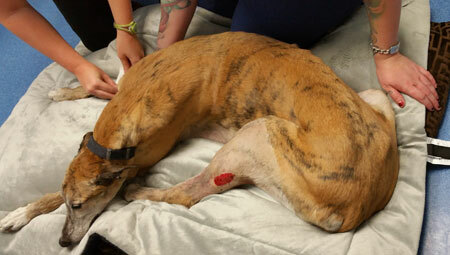 Happy Feet is a 7-year-old male neutered greyhound who presented with a small swelling on the left hock/ankle in July. The swelling disappeared after a course of antibiotics. Two months later, the dog returned because the swelling came back. This time, however, it did not go away with antibiotics. A needle was put into the lesion and this yielded blood. An in-house ultrasound of the swelling was performed and cavities of suspected blood were seen. A tentative diagnosis of hemangiosarcoma was made. The owner elected to have a biopsy performed which required surgery. Bloodwork was performed and was normal. There was no spreading of the cancer seen in the chest, as three views were done. Through a relatively small incision, a sample of tissue was obtained. As suspected, there was an enormous amount of bleeding at the incision site, which was well controlled as part of the procedure before closure. The biopsy's result was intramuscular hemangiosarcoma. Hemangiosarcoma is a type of cancer that primarily infiltrates the blood vessels of dogs; it is rarely found in cats. Cause of death is often a rupturing of a blood vessel due to the cancer which causes the animal to bleed to death. Often, hemangiosarcoma affects the spleen, heart ,or liver. It is rarely seen in the intramuscular area, but Happy Feet was one of the exceptions. Intramuscular hemangiosarcoma is very aggressive and metastasis, spreading, is common in the lungs. From the time of diagnosis, the dog will be gone within the year, typically much sooner. Location can determine prognosis. For example, if found very early and located on the leg, the removal of the leg may perhaps prove curative if the cancer has not yet spread. Unfortunately, this typically is not the case because the cancer usually has already spread, even if the leg is removed. Even with chemotherapy, prognosis is poor. Hemangiosarcoma of the spleen is relatively common among dogs; it is frequently seen in greyhounds. The prognosis is always bad. A dog will act abnormal and lethargic and the owners will bring their pet to the veterinarian for an examination. Physically, pale gums can be seen and sometimes a swelling is present inside the abdomen where the spleen is located. Bloodwork will show low red blood cells if there was a bleeding event causing lethargy. Sometimes bloodwork is actually normal. Radiographs of the abdomen will often show a large spleen. If a large spleen is seen on x-ray, clients are left with a choice to remove the spleen or leave it alone. An ultrasound of the abdomen can actually show the architecture of the spleen, and there is a distinct appearance on ultrasound that can be consistent with hemangiosarcoma. However, the same appearance can be seen when there is just a bruised spleen (hematoma) without cancer. A definitive diagnosis of hemangiosarcoma requires surgery to remove the spleen so a biopsy can be performed. If the spleen is simply enlarged and removed for fear of cancer but is benign the dog can live a long and happy life without his or her spleen. In fact, if the spleen is just large, which we see in greyhounds and that is accompanied by loss of appetite, they do much better without their spleens and their appetite returns to normal post-operatively. No one really knows why greyhounds get large spleens, but performance enhancing drugs administered at the tracks has been suspected. If splenic hemangiosarcoma is diagnosed, the dog will do well for a month or so. Because this is a cancer of the blood vessels, the cancer will eventually eat away at a blood vessel in the abdomen causing the dog can bleed to death. If possible, prior to surgery to remove a suspected hemangiosarcoma spleen, a full work up is recommended to make sure other organs are not infiltrated by cancer. This process is referred to as staging the cancer and it is done to anticipate prognosis. This includes x-rays of the thorax to see if the cancer has spread to the lungs. It can also include an abdominal ultrasound to see if the cancer has spread to the liver or lymph nodes. Bloodwork is also performed to see if any of the organs have been adversely affected. By staging, we can decide if further treatments are going to prove helpful. The problem with chest x-rays, however, is that sometimes we are unable to see the cancer that is present. However, if we do see the cancer in the lungs, this carries a very grave prognosis. Throughout the country, there are clinical trials taking place to try and help animals with cancer. The website vetcancertrials.org is a website that directs the public to the various trials based on the cancer with which their pet was diagnosed. Sometimes there is even funding offered. It is critical for the well-being of your beloved pet to make sure the trial is worth it. This cancer carries such an awful prognosis that euthanasia is typically recommended above all else. Hopefully one day there will be a cure! After Happy Feet's biopsy, he never quite returned to being his happy self. Although the wound healed from the biopsy procedure, his cancer was spreading and his owners brought him in to put him to sleep.